Sundays has always been about the family meal around a table. With time, this table has moved from the dining room of our homes to the lavish brunch spreads at star hotel restaurants. And why not - the family meal now expands to include friends and extended family, its saves you the hassle of cooking elaborate meals, gives you a choice unlike anything you can have at home and also takes care of the kids entertainment, ensuring you have a great time. This is the basic premise of the Mövenpick Spa and Hotel Sunday brunch too, one which we were recently invited to experience. A complete, family affair, this brunch promises over 250 dishes spanning multiple cuisines, and something for even the fussiest at the table. Previous experiences of heading out to Mövenpick have made us wary - if you do not live in the 10 km radius of the hotel, you are bound to spend the wrong part of an hour or even two getting to there. If you have that sorted out as we did this time (an invisible hand seemed to be clearing traffic out for us + it was a Sunday), you will make it to My Place - the all-day dining restaurant of Mövenpick with your sanity intact. At the time of our visit, the smart folks at Mövenpick decided to organize the brunch, live counters and buffet spread, completely indoors. The legend that Bangalore's great weather once was, has not been playing good spiritedly off late. This means that the dessert counter greets you at the entrance of the restaurant, and who's complaining? You know right away what you want to keep space for. Once you enter the restaurant, you will see large families grouped together around tables and taking a closer look at everything on offer and of course helping themselves to it all as well. 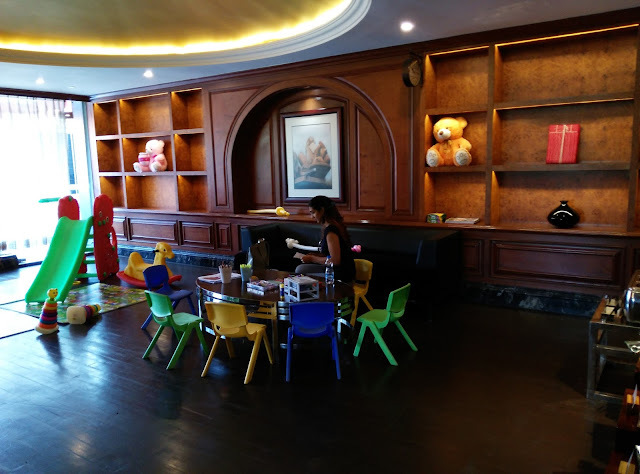 But, what made me, a mummy to a 9-year-old high on life child, is the dedicated play area with a children's buffet and a supervised activity corner all set up. To not have your child hover around the table, yet be satisfied with the knowledge that they are happy, playing, safe and have a good choice of food gives Mövenpick 10/10 on the kid-friendly factor. After all, happy baby=happy mummy! The play area for the kids is perfect for kids up to the age of around 10 years with slides, skipping ropes, hula hoops and supervised art activities. The buffet spread included pancakes, Cheesy spaghetti, french fries, potato smileys, frosted cupcakes, mini cakes, chocolates. What is a brunch without some good alcohol and Mövenpick has a fairly good selection of spirits - Fratelli wines, Sula Champagne, beers like Sab Miller, Fosters, Peroni and Carlsberg and a range of cocktails that will be mixed with Indian or select imported spirits. What you must not miss, even if you have to wait your turn, is the much in demand cocktail trolley that winds its way around the tables. We had the trolley at our large table for quite a while. Besides the many drinks that are whipped up, you will get a quick Masterclass in throwing together a cocktail, and be taken through some interesting house-made syrups that can be included in your drink. The Apple-Cinnamon was a superlative mix that we had included in multiple drinks. While you wait for the trolley to come to your table, you can always choose to have something from the bar that has it all! definitely be a bigger hit! I like to go through a buffet, section by section and naturally tend gravitate towards the Asian section first. You will find a sushi and dimsum counter placed together with all the associated dipping sauces and accompaniments placed around. In sushi you have a choice of maki and nigiri sushi in salmon, prawn and mixed vegetable all of which were pleasant. Chicken and vegetable dimsums were the choice, though the dimsums did tend to crumble on the touch and have a thicker shell than is usual. The Mediterranean Spread included a live shawarma rotisserie, some really good pita bread and all of the classic dips of tabbouleh, baba ghanoush, hummus among the accompaniments that go into your shawarma. I went back for seconds of the dips. The meat for the shawarma is sliced for you as you stand there, it is succulent and has a nice sear to it as well. The highlight of the European spread was the Parma Ham, Mascarpone and Arugula pizza - Make sure to get a few slices on to your plate as soon as you spot this because they disappear just as soon as they are brought onto the table. There is a pasta station for you to whip up something you like and some great roasts for you to indulge in - The Roast Leg of Pork was particularly enticing with a nice jus to go with it. And though I didn't spend as much time as I wanted at it, the chaat counter was packed all through our time there. While we did have a round of pani puri at the table, things got even better when we did some pani puri shots with vodka all thanks to a dining partner at the table. Another highlight of the spread was the Grill Section which has a mix seafood and meat - the best of all that we had were the lamb shanks, the pepper beef, some superlative calamari, the tandoori prawns and though I don't much care for Basa, the Hariyali Basa did warrant seconds. There is a lot more like salmon and seer fish as well as meat sausages to choose from, so do spend your time here. Very happy inclusions on the brunch menu are fresh oysters served complete with a slice of fresh lemon. You don't get to see that often. Also available is rabbit - grilled... another meat that often does not find its way to brunches. The German Spaetzle was an interesting addition as well. To the far end of the buffet is a lovely line up with all the trappings to make a great salad of your choice - from meats and seafood to veggies and a range of dressings, there is so much for you to choose from. The dessert counters have a lot of desserts on offer and we all shared a selection of them from counters. The meal truly ended when a plate of hot jalebis came to the table. If you are wondering, Mövenpick icecreams were not on the menu that day, despite the ice cream counter carrying the signage. It was a little disheartening and we did make our disappointment known to the management. The Sunday brunch at My Place at Mövenpick Hotel and Spa begins at a great Rs 1500++ for a non-alcoholic brunch going up to Rs 2900++ for the champagne brunch. There are options in between as well. Good food, live music, a dedicated kids play area are the perfect ingredients in the recipe that makes a perfect Sunday Brunch with the family!